This exclusive commercial system creates a major profit center by turning signatures, graphics, text, clip art, photos and logos into pre-inked stamps while your customers wait. Everyone knows that stamps help people get through practically every job faster and easier, but no one ever plans ahead to buy a stamp. But when your customers need one, they need it now! And you can give it to them with the Brother Stampcreator PRO™. With this innovative system, virtually anything you can view on a computer monitor can become a custom designed, professional pre-inked stamp. With Stampcreator PRO's proprietary 600 dpi technology, anything is possible and everything is reproducible. The Stampcreator PRO is an ideal bonus profit opportunity for anyone in the stamp manufacturing business or in the related fields of printing, stationery, mailing centers, copy centers, office supplies or other personalized product or office equipment business. Complete marketing support comes with the system including an attractive counter display, 24" x 36" poster to display proudly on your wall, plus illustrated catalogs and envelope stuffers. These support items are always free to customers using the Stampcreator System - just ask and receive! Complete System! -- The SC-2000 Processing Unit comes complete with Windows software, serial and USB cables, thermal ribbon cassette, 150 draft sheets and five stamps. The illustrated instruction manual and interactive tutorial will show you the way to use the system in great detail, but if you ever need technical assistance it is just a toll-free phone call away. One-year warranty is included. To get you started in stamp production with the Stampcreator System, we offer five assortment packages of stamps to choose from. Packages range in quantity from 24 stamps to 225 stamps. Order your preferred package separately. If you have a specific stamp need you may want to skip the packages and order specific sizes and colors instead. JMP Low Price Promise! -- Brother's suggested retail price on this system is $2,999.00. 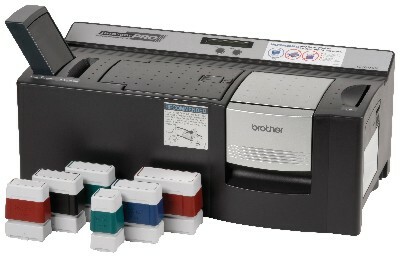 We offer the Stampcreator PRO System for just $799.00 explaining why we are Brother's largest selling distributor! Occasionally other resellers offer "refurbished" or "demo" systems at lower cost. Call us before you commit to any other offer -- we promise to always be competitive on comparable equipment and supplies. OS: Windows 2000 Professional/XP/Windows Vista/Windows 7 (32-bit and 64-bit operating systems are supported). Click here for a link to our full information!